The Rose Island Lighthouse in Narragansett Bay. ROSE ISLAND, R.I. — If you were disappointed as a child (or as an adult) when you realized you probably weren’t going to become that lighthouse keeper you always wanted to be, your luck has changed. At Rose Island Lighthouse, you can at least pretend to be one when you stay overnight. 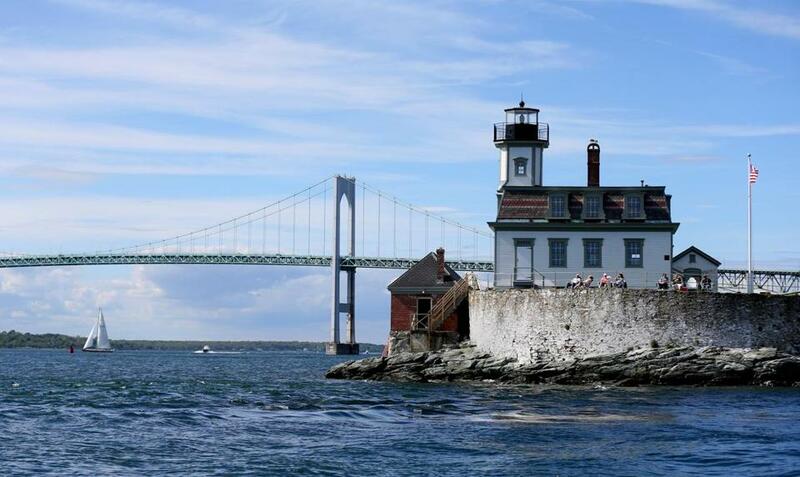 The lighthouse is located on tiny Rose Island, nestled near the Claiborne Pell Newport Bridge one mile into Rhode Island’s Narragansett Bay. Rose Island is one of the only lighthouses in New England that allows year-round overnight stays. It also has a unique “Keeper For A Week” program for the more intrepid, which gives guests a tax deduction on their visit if they volunteer for roughly 30 hours a week, painting, gardening, or doing general upkeep. By the way, they’re almost totally booked through September. I arrived for my night-as-keeper, as all guests do, by boat. Specifically, by The Starfish, an old lobster boat driven by property manager Chris Papp. He picked me up at Fort Adams State Park in Newport, where I left my car for the night (parking pass $10, boat transport $18.50). It was short hop to the Rose Island dock. Chris gave me a run-down of the lighthouse’s history: It was built in 1869, but abandoned after the Pell Bridge became the major light source for the harbor in 1970. Rose Island Lighthouse Foundation began restoring it in 1984, with community donations. Now the overnight stays fund more than half of its upkeep. The island is less than a mile long and wide, and it feels smaller in the summer months because nesting birds take over a portion of the island and visitors aren’t permitted to disturb them. For humans, there’s the lighthouse, a surrounding lawn, Revolutionary War-era barracks, and a rocky beach rife with shells and sea glass. The view in every direction is postcard-perfect. 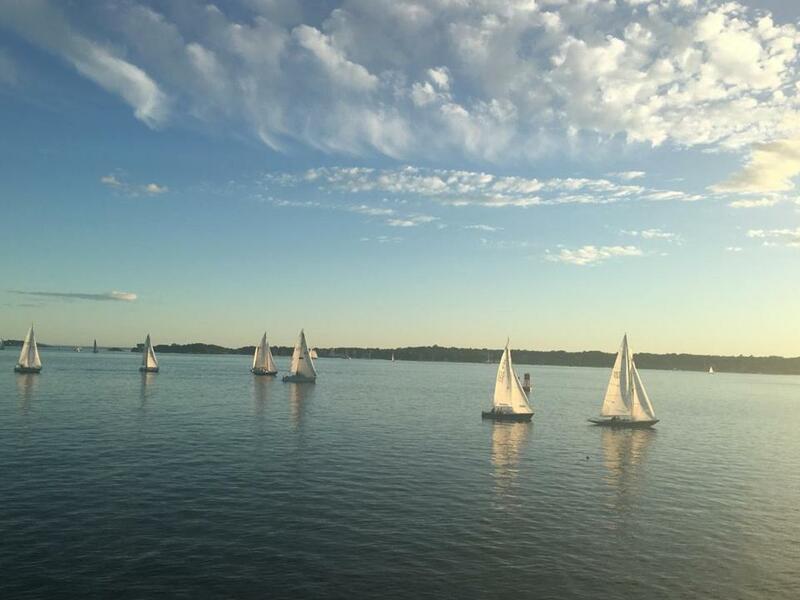 Sailboats drifted by Rose Island in the late afternoon and early evening. After Chris left, my only companions were a young couple from Virginia, and Sam, the resident seagull whose girlfriend is nesting against the lighthouse. The lighthouse has six rooms available, and can actually accommodate up to 14 people. I stayed in the Foghorn Room, which contained a foghorn once upon a time. Now it houses guests and has the feel of a ship’s cabin — four windows and water in three directions. There’s a view of the Newport Bridge, a functioning woodstove, and no electricity. The other rooms do have electricity, powered by wind turbines and a generator. There are more rustic elements of staying on Rose Island that remind you that, well, you’re on an island. No Wi-Fi, for one, though cell service works pretty well. Guests are expected to bring their own food and pack out their trash (except compost, which goes into the garden) and to change the sheets at the end of their stay. Also, water is a precious resource. There’s bottled drinking water, but otherwise, the lighthouse runs off collected rainwater. Guests are encouraged to use the outdoor bathrooms as much as possible, and not to flush until they are the third person to pee. (You participate in a pee-tally by moving periwinkles along a wire, and then moving them back after a flush.) Sustainability on Rose Island is more than a conceptual ideal; it is practical and necessary. It also adds to the romance of pretending that is 1870 and you are the lighthouse keeper’s daughter. I spent the afternoon perched in an Adirondack chair with a book, and paddling around in one of Chris’s kayaks. It wasn’t quiet, exactly, but the sounds were wonderful: the gentle clang of a nearby harbor buoy, the caw of loons and seagulls, the lapping of waves. Sailboats drifted by as the sun started to set. Some guests fish in their spare time, especially later in the summer when striped bass run wild. Others feast on seafood brought from the mainland (the Newport Lobster Shack is a good place to pick some up) or use the grill out back. There are two well-equipped kitchens inside the lighthouse. Chris told me that most guests spend the day on Rose Island, though occasionally people go with him to Newport for a mansion tour, a day at the beach, or to restock on food and booze. Another option if you’re looking to get off Rose Island for the day is to hop on the ferry to sleepy but charming Jamestown. Don’t miss the boat back, though. At night, lights of all kinds emerge, of the half moon and constellation variety. The Pell Bridge lights up like a string of Christmas lights. The introduction of these bridge lights is what put the Rose Island lighthouse out of a job in 1970. But today, if you climb to the top of the lighthouse tower, you can stand next to the glass bulb as it blinks and blinks into the darkness. 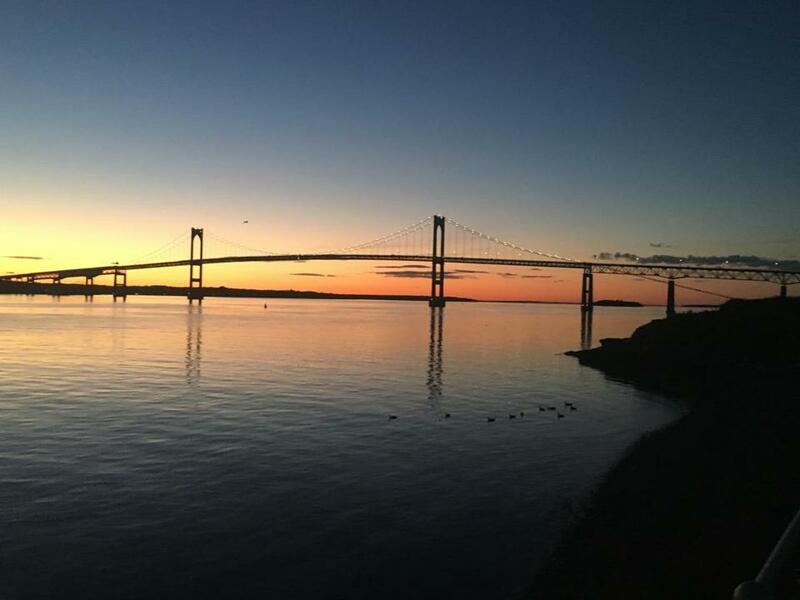 The view of the sunset over the Newport Bridge from Rose Island Lighthouse.